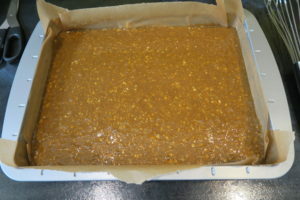 In a pan on a low heat I melted together butter, light brown sugar, black treacle and golden syrup. Don’t let the mixture boil. 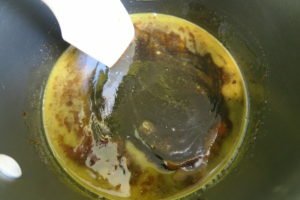 Black treacle and golden syrup are very sticky and gloopy so put the pan on your scales and measure them directly into it. 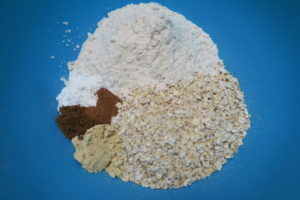 In a large bowl I mixed together porridge oats, plain flour, baking powder, ground ginger, mixed spice, nutmeg and a pinch of salt. 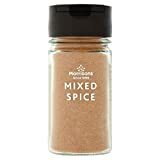 I poured the warm treacle mixture into the bowl and combined the ingredients with a wooden spoon. In a small bowl I beat eggs and milk. I added it bit by bit to the bowl, mixing in well each time. 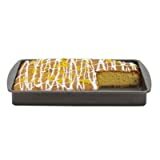 I poured the mixture into the lined tin and baked it for 35 minutes. Once it was cool, I cut it into squares. 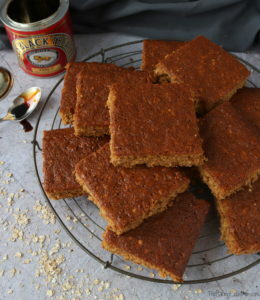 Some people recommend waiting 3-5 days before eating the parkin so the flavour and stickyness can mature. I just digged right in! It was nice and sticky, and had a great shine to it. 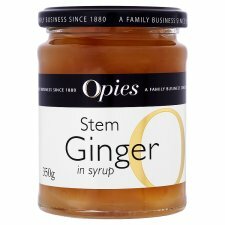 The oats give it a great texture, and the ginger is delicious. Custard was made to go with parkin! It also tastes good with double cream. Parkin is somewhere between a brownie and a cake. It’s hearty, filling, and very moreish – just what you need for these cold dark nights! That Parkin looks fantastic. And having custard with it – you decadent devil! Also very impressed you managed to wait 3 days. I'd have had it straight from the oven! Thanks Sarah! Well I just made other stuff in the 3 days to distract myself haha. Hahaha! A woman after my own heart. The scones looked to be the perfect distraction! I would just like to chirp in that the parkin looks absolutely fabulous. I want some! I’m so glad you’ve enjoyed the recipe Freya!